Every business today needs a website, even if it has only one employee. If you don’t have a site, you are leaving a lot of money on the table. You can attract several potential clients if you have a website that is both attractive and informative. When you need to go online, you will have to choose a web hosting service provider and then create your page. When you come to Mambo Microsystems Ltd, you will forget about your worries. We are Kenya’s best-ranked web hosting company! We provide quality services at reasonable prices and are committed to meeting our clients’ unique and diverse expectations. Our hosting services come with monthly backups such that if you delete your files by accident or hackers access your site, you can restore it with ease. When you come to Mambo Microsystems Ltd, you will not worry about losing your website. Another reason we are Kenya’s best-ranked web hosts is our hosting speed. We want to improve our clients’ experience and make their websites enjoyable to visit. With our services, you are assured of higher conversion rates and an increase in traffic to your site. Read what our clients have to say on our testimonial page when it comes to our speed and efficiency. Because your website is an important aspect of your business, we do not take your data for granted. Many clients opt for our services because of the security software we employ in protecting their data. We use the latest firewalls that guarantee your safety online. We take into consideration every single detail in ensuring we meet your needs, and it is what makes us Kenya’s best-ranked web hosting company. 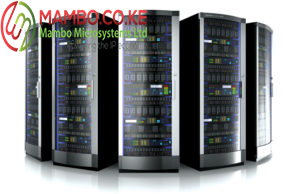 Hosting with Mambo Microsystems Ltd is the best experience I have had. Many cheap hosting companies always promise 100% uptime but fail to deliver. Mambo addresses any hitches in no time to ensure I’m always online.